1. You experienced a flash of inspiration. 3. You opted to stage your remake in the world of college basketball. Assuming you went through these steps — and I don’t recommend it, beyond the original flash of inspiration — there’s only one man you could cast in the role of Lucifer: Wisconsin coach Bo Ryan. Why? Well, first off, he looks like you might expect the devil to look like if he returned to Earth. Look at the picture above, or just do a Google image search for “Bo Ryan.” The menacing eyes, the wicked grin, the villain’s hair; it’s evident. Second, I think he might be a threat to ruin the game. Carolina fans have a habit of ratcheting up the noise when the opponent’s shot clock nears the 10-second mark, and usually they’ve got it right; if a team can’t create a shot by then, they’re out of sorts and close to panic. But it slowly dawned on the Heel faithful that their cheers were misplaced against Wisconsin. The reason the cheers were off-base was that Ryan’s Badgers usually don’t shoot until the very end of the shot clock. And while the game against Carolina was a fascinating clash of styles (the Tar Heels are one of the 10 fastest teams in the country, and they won that game 60-57), a harrowing thought occurred to me afterward — what if every team played like Wisconsin? Frankly, there’s no reason they shouldn’t. Ryan has had unbelievable success since he took over in 2001, winning three Big Ten regular season championships, two Big Ten tournament championships, and earning an NCAA berth every single year. His resume in March has been a bit disappointing — the Badgers have reached the Elite Eight just once, and they’ve lost in the first or second round in six of his ten years — but the continued success of Ryan’s teams can’t be questioned. And how has he done it? What do I mean when I say “play like Wisconsin”? Ryan’s style, first and foremost, is a matter of pace. More to the point, his teams play slow, boring basketball. It’s Ryan’s way of neutralizing talent; according to ESPN’s rankings, he hasn’t had a Top 25 recruiting class in the past six years. And I’m not even sure he’s trying. Instead, he goes after players who fit his system, and spends his time grooming them to be efficient upperclassmen. This year follows form; of the six players who earn the most minutes per game, four are juniors or seniors, and none are freshmen. And all of them play at a snail’s pace. There are currently 345 teams in Division I, and of those, Wisconsin ranks 345th in adjusted tempo, per Ken Pomeroy. Even without adjusting for the pace of an opponent, Wisconsin averages just 60.2 possessions per game, third-lowest in the country. And it goes without saying that if Wisconsin manages just 60 possessions per game, that’s exactly what the other team is getting. 1. It frustrates the opposing offense. When a team fails to score against Wisconsin, it knows it have to wait at least 30 seconds before it gets another chance. The pressure mounts on every possession, and small deficits suddenly loom large. Ryan recruits strong, tough defenders, and their stinginess only augments that aura of impenetrability. 2. It wears down the defense. By forcing a team to defend for 30 seconds on almost every possession, Ryan exposes flaws in the opponent that tend to become exaggerated by mental and physical fatigue as the game goes along. The withering persistence clearly takes its toll on the defense, but there’s a less obvious effect on offense; when a team is preoccupied on one end, it becomes more prone to errors and quick shots on the other, which plays right into Wisconsin’s hands. Three scores from this season demonstrate the extent to which the Badgers change the way basketball is played. UNLV and UNC love to run, and the Running Rebels surprised the Tar Heels early in the season in a fast, breakneck game. North Carolina was content to beat them at their own game, and would have in most cases due to superior talent. But when both teams faced Wisconsin, the Badgers imposed a different style. Which illuminates an important point — it’s much easier to slow a game down than speed it up. Unless you establish an early lead on Wisconsin and force the Badgers into catch-up mode, how can you ever make them shoot the ball early? It’s impossible, and that’s the essence of Ryan. He coaches from a position of strength, compelling other teams to adjust to him. If there’s a psychological philosophy behind all this, you could call it “enforced frustration.” Ryan’s design is not to beat the other team, or to prove Wisconsin’s superior ability, but rather to nullify another team’s strength and experience while undermining their confidence. He doesn’t want a fair fight, because he knows he’d lose. By limiting opportunities and forcing an unfamiliar style, Ryan, like an idiot in an argument, brings the opponent to Wisconsin’s level and beats them with experience. Or maybe a better comparison would be to guerrilla fighters who force a larger, flashier, more well-equipped army to engage them on mountainous terrain. The training and experience of the invading force is nullified, as are many of their weapons, and the guerrillas have an advantage because they know the land. If anything, Ryan has bunkered deeper into this mindset over his years at Wisconsin. 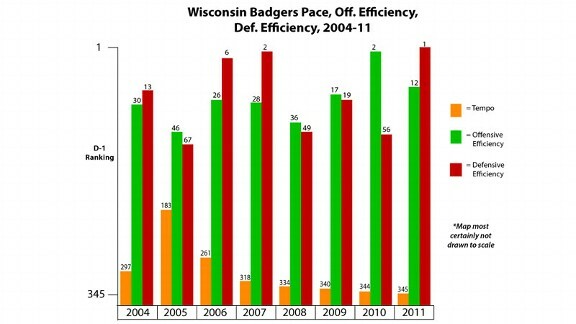 The bar graph below shows three data points for Badger teams since the 2004-05 season. The first is defensive efficiency, as measured by how many points Wisconsin concedes per 100 possessions. The second is offensive efficiency, or how many they score per 100 possessions. Last is adjusted tempo; how fast they play. The team’s respective Division I ranking is shown for each season. Note that that year on the x-axis denotes when the season started, so that 2011 represents the current 2011-12 season. As you see, while there have been fluctuations in offense and defense, the pace has gone steadily downward. Ryan is like a stubborn auteur filmmaker with a strange aesthetic that becomes more pronounced over time. He’s the David Lynch of basketball coaches. Here are a couple stretches of play from last night’s game against UW-Milwaukee. First half, 16:07 – 6:19 — Milwaukee scores four points. Second half, 15:18 – 5:36 — Wisconsin scores three points. And that’s not atypical. Ten minutes without scoring? No big deal in Badger world. It’s the long haul that matters, and the fact that scoring droughts aside, they’ll emerge as victors because they understand how to play dull. Now, pretend you’re a coach at a BCS conference in Division I. Your school is middle of the pack or lower, and you struggle to recruit against the high-profile teams. Why wouldn’t you adapt Ryan’s style? Doesn’t it make sense? He routinely beats teams with more talented players, and he’s building something like a legacy in Madison. You don’t need to worry about stars; Ryan’s best player this season is Jordan Taylor, and he’s averaging just 11.8 points per game. All you need are guys who are willing to work hard, forsake glory, and submit totally to a system of patience and discipline. Fortunately, most new coaches don’t follow this formula. I say “fortunately” because Ryan’s philosophy produces plodding, unattractive basketball. It frankly takes the joy out of the game, and I can honestly say that if I were a Wisconsin fan, I’d trade the steady success of the Ryan years for something more dynamic. I know that sentiment may not be shared in Madison, but there’s something retrograde and cynical about holding the ball for 30 seconds on every possession, not to mention the idea of designing a team around an ideal of psychological frustration. It almost makes you long for the NBA’s 24-second clock. And if a Ryan Revolution ever took hold, the NCAA would have to adjust. The Badgers have blatantly exploited the shot clock. By ignoring the intent of the 1985 rule change, they’ve laid out a risky blueprint for college basketball. The devil is always, always in the details.